Civil society organisations can help to ensure good governance over natural resources as members of global multi-stakeholder initiatives like the Extractive Industries Transparency Initiative. Yet a good number of resource-rich countries have legally restricted civil society organisations’ independence and ability to operate, challenging organisations’ contributions to these initiatives. This has led to initiatives shutting down in some countries, undermined their intended effects, and resulted in the appointment of government-friendly civil society organisations. Donors can counterbalance this backlash against participation rights by supporting efforts to improve the evidence base about organisations’ involvement in resource governance, emphasising the value of their involvement in multi-stakeholder initiatives, and by supporting organisational capacity building as well as information alternatives like media organisations and technological initiatives. Scholars theorise that civil society might help to improve governance over natural resources in four ways (c.f. Furstenberg 2015, Aaronson 2011, Bieri 2010): by providing information, moral legitimacy, democratisation of authority over resources, and accountability. First, civil society can have an information effect. They do this by helping to collect and disseminate information that supports a feedback loop between government and governed. Theoretically, this information cycle empowers citizens to hold their government to account for the use of resources and the benefits of their extraction. Second, civil society may have moral effect. Civil society organisations’ (CSOs) moral authority, grassroots representation, and pursuit of the public benefit can give them the legitimacy to set international and national agendas in terms of which issues matter in resource governance. Third, involvement of civil society in resource governance can have a democratisation effect. That is, CSOs’ involvement in resource governance may help to broaden authority over, and participation in, resource use and decisions about the distribution of costs and benefits from extraction and production. This can reduce the monopoly power and discretionary authority that enable corruption in resource sectors. Finally, civil society may have an accountability effect. As watchdogs, organisations monitor and influence public and private actors’ adherence to the accepted rules of fair resource extraction and production. CSOs can pressure these actors to comply with formal laws and internationally accepted standards of good behaviour. Civil society can improve natural resource governance by providing information, moral legitimacy, democratising authority over resources, and holding government to account for resource use. Although there has been much optimism about CSOs’ ability to play a strong role in bringing about good governance over natural resources, there are counterpoints and criticisms to the four points above. First, there is only mixed evidence regarding the ability of CSOs to empower ordinary citizens to effect positive change in resource governance. Second, CSOs do not necessarily represent the grassroots, but rather elites and the issues of interest to Western donors in particular. Finally, CSOs may stress upward accountability to funders rather than downward accountability to their constituents, while organisations that can secure more resources or have closer connections to government can drown out the voices of other groups and issues (c.f. Barr, Fafchamps, and Owens 2005). One way in which CSOs can try to influence resource governance is through membership in multi-stakeholder initiatives (MSIs). These initiatives bring together three key players in resource governance: the government, the private sector, and CSOs. Ideally, these three stakeholder groups work together on a voluntary basis within an MSI to address challenges in resource governance through collaborative dialogue and decision-making. MSIs are often designed to build trust between the involved stakeholders and to enable progressive action in an issue area where regulation or private sector actions on their own have failed to achieve change. Their collaborative design can help drive reform and gain public confidence. However, the degree to which these initiatives are actually able to attain positive change and contribute to development outcomes is still out for debate (Søreide and Truex 2011; Koechlin and Calland 2009; Rustad, Lujala, and Le Billon 2017). Examples of international-level MSIs and their founding years include the Forest Stewardship Council (1994); the European Union’s Forest Law Enforcement Guarantee and Trade Process in Developing Countries (FLEGT) (2003); the Marine Stewardship Council (1997); the Kimberley Process Certification Scheme (2002); the Extractive Industries Transparency Initiative (EITI, 2002); and Better Coal (2011). There are also examples of local-level initiatives, such as Tanzania’s Mining Inter-Stakeholders’ Forum. CSOs are both founders and members of many of these initiatives; for instance, CSOs such as Publish What You Pay played a strong role in creating and launching the Extractive Industries Transparency Initiative. Generate and share information (the informational effect). Set standards (the moral effect). Facilitate dialogue between stakeholders (the democratization effect). Monitor initiatives’ effectiveness (the accountability effect). 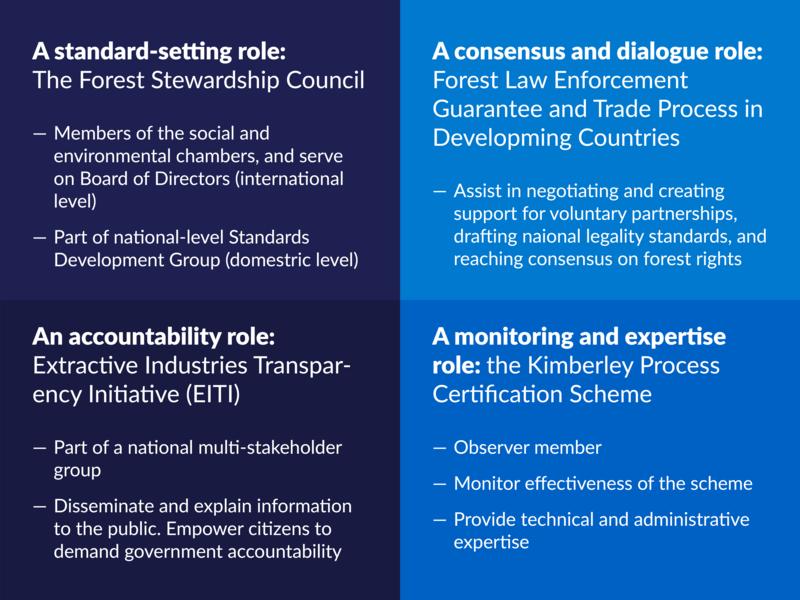 Multi-stakeholder certification schemes such as the Forest Stewardship Council and the Kimberley Process Certification Scheme rely on CSOs to help set standards and also to evaluate and monitor the initiatives’ effectiveness. In reporting initiatives like EITI, CSOs are expected to generate and then use information to reach out to, and mobilize, citizens of resource-rich countries to hold their governments to account. Finally, verification initiatives like FLEGT depend on civil society to help build the grassroots consensus around an MSI required for the initiative to function. In recent years, a number of countries that produce and export (or soon will) high-value resources like oil, gas, metals and minerals, and timber have adopted new types of restrictive civil society legislation. The list of countries includes Afghanistan, Angola, Azerbaijan, Cameroon, Democratic Republic of Congo, Ecuador, Ethiopia, India, Indonesia, Iraq, Kazakhstan, Kenya, Mozambique, Myanmar, Russia, Tajikistan, Tanzania, Timor Leste, Uganda, Ukraine, and Venezuela (based on data from Dupuy, Ron, and Prakash, 2016). These new legal provisions constrain how organisations can mobilise, access, and use resources, in particular foreign-based funds. They also restrict the issue areas on which organisations can work, increase registration and reporting requirements, and stipulate who organisations can employ and partner with (Dupuy, Ron, and Prakash 2016). This backlash against the civil liberties that enable participation – freedoms of association, assembly, and expression – is part of a wider global pushback against democratic freedoms that has been noted by scholars and policy-makers alike (c.f. Freedom House 2016). There are a variety of motivations for governments to adopt these laws, ranging from a desire to improve oversight over organisations to preventing the potential for violent threats from non-state actors to restricting political opposition (ibid; Howell et al 2008). Several resource-rich countries have recently adopted restrictive civil society legislation, limiting the CSOs’ role in natural resource governance. Some examples illustrate the range of restrictions that are being placed on CSOs. Indonesia – home to vast forest and oil, gas, and mining reserves – adopted Law 17 in 2013, which states that CSOs cannot propagate an ideology that conflicts with state principles or disrupts public order and well-being. Regulation 38, adopted in 2008, requires government approval for CSOs to receive foreign funds, and CSOs must report to the government on its use. In Afghanistan, where vast quantities of mineral riches have just been discovered, the 2005 Law on NGOs and Decision of the Cabinet Members on Foreign Funding prohibit CSOs from participating in political activities, and restricts CSOs’ receipt of foreign funds. Likewise, in Kazakhstan, a country with large deposits of oil, gas, coal, and uranium, the 2016 Law on Payments determines which CSOs can receive foreign funding and how it can be used, while the 1995 Law on Elections prohibits international CSOs from participating in any kind of “political” activity. Finally, in Cameroon, a country rich in forests and oil, Law 99/014 requires that government approve the receipt of any kind of funding used to operate, both local and international. Laws restricting core CSO activities like fundraising are problematic for organisations working on resource governance because many such groups rely on foreign funding from bilateral donors, international financial institutions, and private foundations in order to keep their doors open and to engage in advocacy. For instance, the World Bank has provided grants to EITI-implementing countries to enable CSOs to actively participate in EITI processes in candidate and member countries, while the Open Society Foundation also provides funding to local CSOs working on resource governance issues in resource-rich countries. Externally-sourced funding is also vital to building the capacity of CSOs to engage in resource governance processes. Particularly in poorer countries, CSOs do not always automatically have the capacity to collect information and use it to hold governments and private sector actors accountable, and they rarely have access to a strong domestic revenue base. Moreover, regulating the issue areas in which CSOs can engage can allow governments to easily label things like resource governance as a “political” issue and bar organisations from working on resource governance altogether. This is concerning, given that governments normally exercise a high level of monopoly and discretionary power over resource extraction and production, which creates both opportunities and incentives for corrupt behaviour. In general, restrictive legislation can prevent CSOs from fulfilling the four theoretical roles outlined at the beginning of this brief. Specifically, existing anecdotal evidence suggests that restrictive civil society laws and policies are currently challenging the ability of CSOs to participate in multi-stakeholder initiatives in several ways. First, these laws and policies can prevent an initiative from operating at all in a given country. This recently occurred in Azerbaijan, which was downgraded from full EITI member to candidate country and then suspended entirely in 2017 due to the EITI Board’s concern about the ability of civil society to engage meaningfully in the initiative. Second, legal restrictions on civil society can undermine the intended effect of an initiative. This has occurred in Indonesia, where Human Rights Watch reported in 2013 that legal restrictions on civil society have reduced organisations’ ability to oversee the multi-stakeholder Timber Legality Assurance System. This is so for two reasons: first, because the existing legal restrictions allow the government to impose penalties for the undefined misuse of public information and interfere with groups viewed as posing a danger to the national interest. Second, the 2011 State Intelligence Law allowed government to classify information about natural resource sectors as exempt from disclosure requirements “in order to protect the country’s ‘national economic interest’” (Human Rights Watch 2013). Finally, by carefully defining in legislation the types of organisations that can be classified as civil society as well as the issues on which certain types of organisations can work, governments of resource-rich countries are able to maintain tight control over the organisations they permit to work on resource governance. This makes it easier for governments to appoint pro-government CSOs or so-called government non-governmental organisations (GONGOs) to MSIs, undermining the independent role of civil society to hold government to account. For example, Ethiopia’s 2009 Charities and Societies Proclamation created new categories of organisations based on their funding source, and prohibits work on “political” issues such as human and democratic rights by any organisation that receives more than 10% of its funds from abroad. As a result of the adoption of this law, there are almost no remaining independent rights-focused organisations in Ethiopia, limiting the presence within initiatives like EITI of groups that have a rights-based focus on natural resource management. Donors can take a number of steps to try to support CSOs’ roles in MSIs. First, they can focus efforts on building the evidence base regarding the conditions under which CSOs improve resource governance and the outcomes of CSOs’ efforts. This would provide a better base from which to argue that civil society has a vital role to play in preventing or overcoming the resource curse. Second, as part of this evidence-gathering exercise, donors can emphasise to countries with restrictive legislation that independent CSOs are critical to the efficacy of multi-stakeholder initiatives. Third, donors should continue to support CSO capacity building to enable them to fulfill their transformative role in resource governance. Without resources and training, many local CSOs in particular will struggle to keep their doors open, let alone fulfill any of the four functions for CSOs in resource governance. Finally, and particularly in contexts where civil society space is severely limited, donors could consider supporting large international CSOs and other organisations to pressure highly repressive countries to govern their resources well. Donors could further choose to support both domestic and international journalists and media organisations, as well as the use of new technological initiatives and social media platforms (c.f. Aarvik and Dupuy 2017), to try enable citizens to hold government and resource companies accountable. Doing so could also facilitate the enhanced flow of information about resource extraction and production. Doing accountability differently. A proposal for the vertical integration of civil society monitoring and advocacy.